Beech C-45G "4X-ADS" (AF-126) at Prestwick, Scotland in December 1957 on delivery to El Al Airlines, Israel, in company with 4X-ADQ. Both came out of storage at Davis Monthan AFB, Arizona and had hand-painted Israeli registrations, but the registrations were transposed. 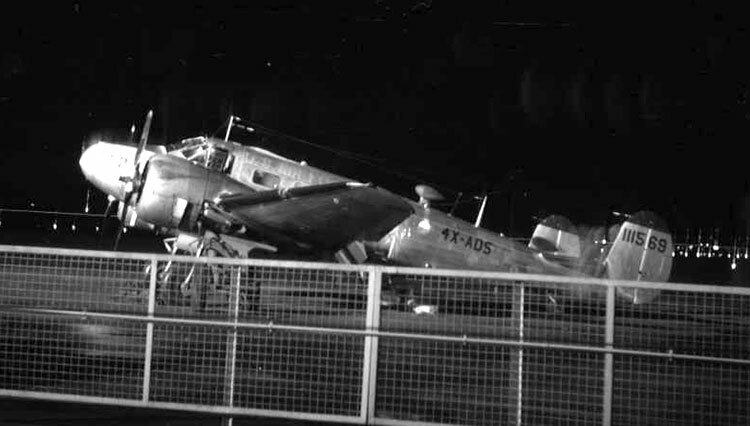 The proof is in this picture, taken by Gordon Reid who happened to be loitering at Prestwick late that night. 4X-ADS has USAF serial 111569 on the tail fins which makes it AF-126, although it was formally registered as 51-11504/AF-61. The Davis Monthan AFB storage code "1A2" is on the nose.